I am 13 years old and love to hang out with my family and friends. We play kickball, basketball, baseball, play xbox, ride bikes and watch movies. My favorite part of the year is the summer. I get to hang out at the beach and don’t need to worry about any homework. I have CF but it doesn’t bother me much. There’s a lot of treatments I need to do throughout the day but it’s ok. I also have to take meds with everything I eat. For me to stay healthy I know I need to do my workouts, take my meds and stay away from germs. It’s a lot to remember but I do a good job. Every year we have two really big events that raise tons of money for CF. One is in January and the other one is in June. The January event is called Breathe White and is for adults in NJ. Lots of my family’s friends go the event to help support CF. The other event is in June and is really cool cause we get to walk thru NYC and hang out with my all family & friends. 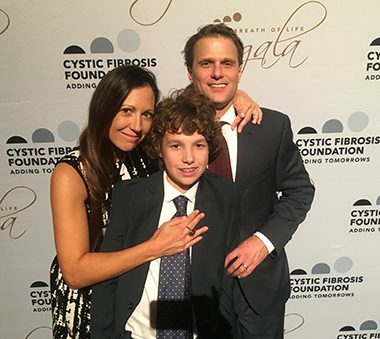 Since I was born, we have raised almost $825,000 for CF!!! I am very thankful for everyone.